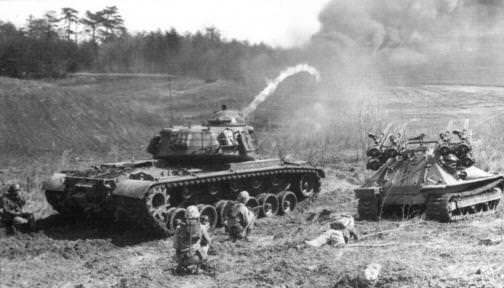 The United States Marine Corps (USMC) was no stranger to the use of flamethrower equipped tanks. The Corps strongly advocated for the deployment of such vehicles. American early flame-throwing tanks, such as the M3A1 ‘Satan’ and variants of the M4 Sherman, were used to great effect against the heavily entrenched Japanese forces in the Pacific in WW2. 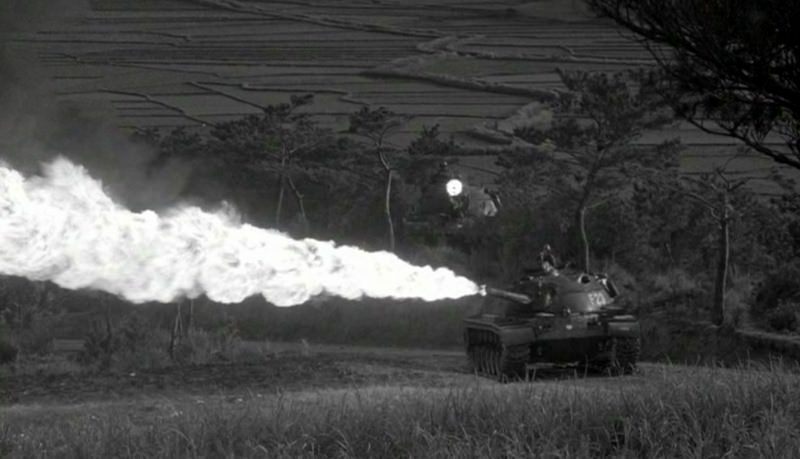 With the outbreak of the Korean War, the Marines were practically begging for a new flame-throwing tank. All that they had at that time were the M42B1 and B3, flame throwing tanks built on the chassis of the out dated M4 Sherman. This led to a request for a new, up-to-date flame tank. The answer to this request was the M67, also known as ‘Zippo’ (after the popular brand of lighters), based on the 90mm Gun Tank M48 Patton III. It would, however, arrive too late to see action in Korea. 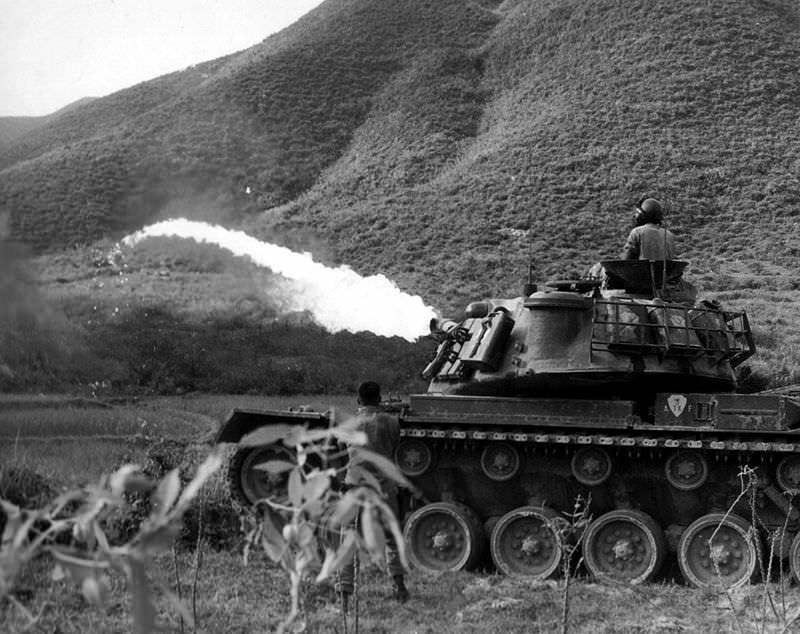 In the final stages of the Second World War, the United States Military, fighting the Japanese in the Pacific, realized the effectiveness of tank-based flamethrowers, particularly in dealing with a well-dug-in enemy force. They would first be deployed in the shape of field expedient modifications of the M3 Light tank (resulting, for instance, in the ‘Satan’). Such vehicles would then progress further into serialized developments of the Medium Tank M4A1 and A3. These were designated M42B1 and B3. 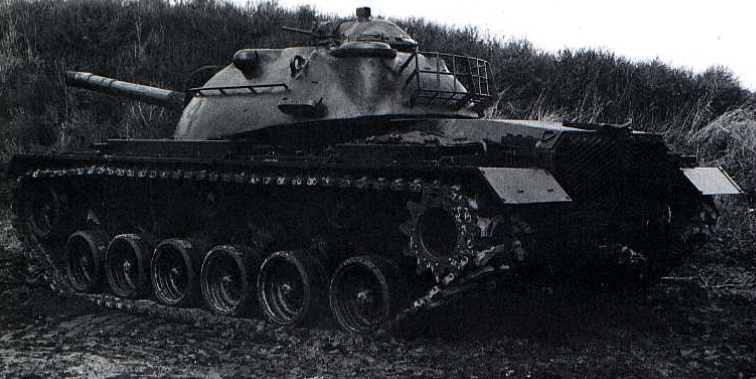 Post War, development continued on flame-throwing tanks on newer chassis. The M26 Pershing was first tested for conversion in October 1945 as the T35. This went through a few designs, including mounting the flame equipment in the turret, replacement of turret with a casemate structure, and finally a trailer configuration similar to that of the British Churchill Crocodile. None of these designs were accepted for production or service, and the T35 project was canceled in 1948. Believing that tanks with a flamethrower main armament had a limited infantry support role on the battlefield, the US Military wasn’t keen on developing a vehicle with such a configuration. The United States Marine Corp (USMC) however, disagreed. The Marine Corps’ primary use of tanks was in a close infantry support role and the effectiveness of flame tanks was already demonstrated to them in fighting against the Japanese. Come the time of the Korean War, the Marine Corps were effectively pleading for a new flamethrowing tank to replace the outdated M42B1 and B3s which they had no choice but to use. Following this, work began on a flamethrowing tank based on the 90mm Gun Tank T42, which was supposed to be America’s next medium tank. With the complications that arose from the T42, the project was moved onto the 90mm Gun Tank M47 Patton II. (This was the combination of the T42’s turret with the M46’s hull. The famous answer to the ‘Korean Tank Panic’). This variant was designated the T66, with the flame projector mounted in the turret in place of the 90mm gun. Only one prototype of this tank was produced before the project was canceled, due to the fact that by the time this single vehicle had been built, the M47 itself was being replaced by the new M48. The M48 Patton III was the third in the line of tanks named after the World War Two American General George S. Patton. 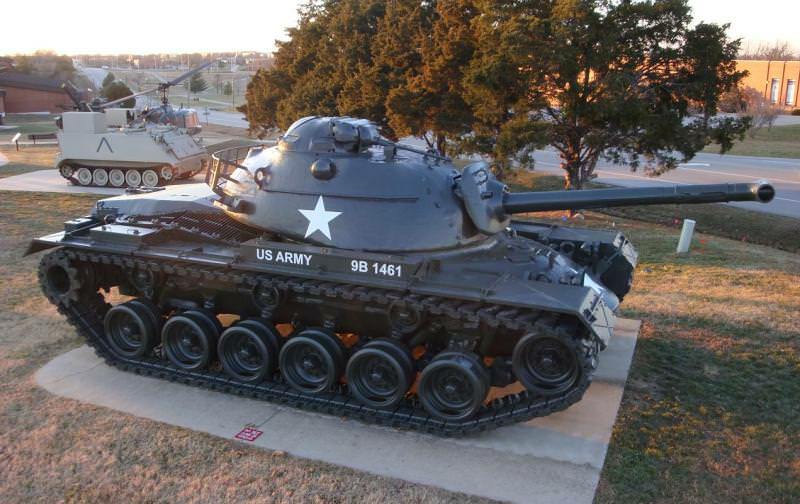 Entering service in 1953, the M48 replaced the rushed, but well serving, M47 Patton II, and was one of the last tanks in US military history to carry a 90mm main armament. The tank weighed about 50 tons, with armor of up to 110mm thick. The tank was powered by a 650 hp Continental AVSI-1790-6 V12, air-cooled twin-turbo gasoline engine. This would propel the tank to a speed of 30 mph (48 km/h). The tank served with the US Military up to the 1990’s, despite being mostly replaced by the next tank in-line, the M60. While in service, the M48 went through systematic upgrades including a new engine, internal systems and the eventual up-gunning with a 105mm gun. In Autumn 1954, work began on basing a flamethrower tank on the M48. It would be designated as the T67. Main armament would consist of the E28-30R1. This stood for Experimental E28 fuel and pressure system, with 30R1 flame gun. This configuration was later serialized by the Chemical Corp Technical Committee as the M7-6 Mechanised Flamethrower. The component parts were designated as the M7 fuel and pressure unit and the M6 flame gun. The complete system, including the turret, was designated Flamethrower Turret T7. For the prototype, this was assembled inside an M48 turret with the Low-Profile Chrysler commander’s cupola with external .50 cal. machine gun mount. This turret was lowered onto an M48 hull, with the low engine deck housing the early Continental AVSI-1790-6 V12. With the deletion of the standard gun, there was no need for a loader and the number of crew members was dropped to three. This position was taken up by a large, 398 gallon (US) fuel tank for the flamethrower. The Commander and Gunner remained in their traditional positions on the right-hand side of the turret. The only ingress and egress point in the turret was the commander’s hatch as the remaining loader’s hatch was completely blocked by the flame thrower’s fuel tank. As such, the hatch was used to refuel and maintain the equipment. The thickened fuel for the flamethrower was stored in the large 398 gallons (US) central tank. This was the maximum capacity of the tank, but a bit of leeway was given for expansion and other losses or spillages. As such, usable capacity was closer to 365 gallons (US). There was a secondary 10.2 gallon (US) fuel container which supplied un-thickened gasoline to the atomiser, it also coated the main-fuel for ignition in cold weather. The system was pressurized to 325 psi (2240.8 kPa) allowing a 55 second burst with the ⅞ inch (22.22mm) nozzle, and 61 seconds with the ¾ inch (19.05) nozzle. Maximum range for the flame gun was 280 yards (256 meters). Cross section of the M67’s turret. Note the huge fuel tank in place of the loaders position. Photo: Presidio Press. The fuel was ignited by 24,000 volt spark plug igniters in front of the nozzle inside the firing tube. A carbon dioxide snuffer system was also employed at the nozzle to extinguish any residual fuel burning the gun itself after it was shut off. The M6 flame gun was housed in a shroud designed to mimic the appearance of the 90mm T54 gun equipped on the standard M48 Patton in an effort to disguise it as a standard gun tank. The shroud was noticeably wider in diameter and 21-inches (53.34cm) shorter, though it did include a faux tubular ‘T’ shaped muzzle break. This dummy gun barrel had holes in the side allowing the circulation of air necessary for combustion. There were also holes and drip shields at the bottom for drainage. There was a removable cover in the center of the barrel, allowing access to the ignition systems and the whole system was attached to the standard gun shield found on M48’s, and the tube for the fuel pivoted on the same trunnions. Though the system shared as many elevation and traverse components as the standard M48, the M6 Flame gun and complicated shroud made it muzzle heavy. A hydraulic equilibrator device was introduced to balance the weapon which operated throughout the M6’s whole +45 to -12 range of elevation. As well as the flame gun, the gunner also operated the coaxial .30 cal. Browning machine gun as normal. The introduction of the T7 Flamethrower turret and accompanying weaponry necessitated a number of minor, but important, modifications to the M48 hull. The depression angle of the M6 Flame Gun was greater than that of the 90mm gun main armament of standard M48’s, as such, the brush guards of the bow head lights were flattened to allow clearance. The ammunition racks for the 90mm ammunition on the left and right of the driver were removed and replaced by stowage bays for the storage of tools, spare parts for the flame equipment, and ammunition for the machine guns.The auxiliary engine muffler, which was located on the M48’s rear deck, was relocated to the right-rear fender. This was a preventative measure to give clearance to the flame-thrower fuel tank vent which protruded from the left-bottom of the turret bustle. The T67 was now two-years late for action in the Korean War, but work carried on. After going through a number of tests and trials with the Marines, 56 complete T67s were delivered to the Corps, in addition to 17 T7 Flamethrower turrets. All of these were based on the M48A1’s with the large M1 Cupola that has the integral .50 cal machine gun mount. The spare 17 turrets were mated with the modified hulls of M48A1s. The T67 Pilot was also upgraded to M48A1 standard, bringing the total number of tanks to 74 units. On the 1st of June 1955, the T67 was standardized as the Flamethrower Tank M67. At the same time, the T7 turret was designated as the Flamethrower Tank Turret M1. When the M48A2 appeared (with the larger engine compartment and radiator grill) the M1 turret was introduced to the new chassis. This turned the M67 into the M67A1. Along with the chassis changes, the M7 fuel and pressure system was upgraded to US Army standards and redesignated the M7A1. Following this, the Chemical Corps redesignated the whole system as the M7A1-6. Chrysler built 35 M67A1s at their Delaware plant between 1955 and 1956. These were the only M67’s to ever see service with the United States Army, but this was only for a very short period. Further upgrades to the M48 tank soon resulted in the M48A3 with its powerful 750 hp Continental AVDS-1790-2 V12, air-cooled twin-turbo diesel engine. With this upgrade to the gun tank, the Marine Corps requested that their M67’s be upgraded to the same standard. Funds were provided for the Marines to have 35 of their M67’s upgraded to M48A3 standard. On the 1st of February 1962, a pilot of the upgraded vehicle was completed at the Detroit Arsenal. It was designated the M67E1. It featured a number of upgrades also found on the M48A3. These included a new gun shield cover, new fire control systems and the replacement of the coaxial .30 cal. (7.62mm) Browning machine gun with an M73 machine gun. On the 25th of June 1962, the M67E1 was officially serialized as the M67A2. In total, 73 vehicles would be converted to M67A2 standard. The upgrade work would be done at the Anniston and Red River Army Depots alongside the M48A3 upgrade program. In total, the USMC would receive 109 M67’s altogether. The Chrysler Company also developed the T-89 flame thrower kits. This allowed a team of mechanics to turn a standard M48 gun tank into a flamethrower in around eight hours. Actual combat history of the M67 is not very well recorded and is, at best, patchy. This is due to a general lack of record keeping at troop level. This is a common occurrence in the history of many of the tank actions in Vietnam, as described by Oscar E. Gilbert in his book ‘Marine Corps Tank Battles in Vietnam’. With the assistance of such literature, the following section will highlight the known actions in as much detail as possible. The M67A2 conversion program would be complete in time for the vehicle to see deployment in Vietnam with the US Marine Corps, though it would be accompanied by small numbers of the other models including the M67 and M67A1. The M67 was one of two armored flamethrowers used in the Vietnam War. The other was the Self-Propelled Flame Thrower M132. This was a modification of the M113 Armored Personnel Carrier fitted with similar flame equipment to the M67. This vehicle was used by the Army in armored cavalry units. In deployment, the M67 would often be accompanied by 2 ½ ton trucks equipped with special equipment to keep the tank in action. One would carry and refuel the tank’s Napalm supply, while the other would recharge the compressed air system. This was, of course, a drawback. Because of the necessity of keeping the resupply equipment relatively nearby, the M67’s were restricted in what operations they could take part in. An unforeseen problem with the flamethrower was the noise created by the equipment when it was fired. Such was the level of internal noise that the gunner and commander could barely hear each other even when using the intercom. To deal with this, the commander, to his own risk, would often operate head-out. This would improve the audio enough for the crew to understand each other. Some commanders even went as far as haphazardly mounting the intercom outside of the tank, near the hatch. The M67’s first combat came in the August of 1965 with Operation: Starlite, also known as the Battle of Van Tuong. This was the first major US action of the war. The objective was to hold and defend the Chu Lai Air and command base. During this battle, in map zone An Cuong (2), a resupply convoy of Amtrak’s and a 3-tank section of M67s was ambushed and almost completely destroyed by Viet Cong forces. The action around An Cuong (2) was one of the only recorded in any great detail. We do know that the M67 took part in actions such as Operation Dozer and the Battle of Hue. In the Battle of Hue, two M67’s accompanied by M48’s were the first tanks to enter the city. The guerilla nature of the Vietnam War was no hindrance to the M67. It was often used to incinerate any patch of jungle that may look like an enemy position in so called “Rods of Flame” attacks. The M67 would be the last flame thrower tank deployed by the United States military. The tank would stay in service with USMC until its retirement in 1974. In the 1960 World War II film ‘Hell to Eternity’, a number of M67’s were used to represent M4 based flamethrowers during the Battle of Saipan. A few of the tanks have survived. Before its recent closure, one was on display at the US Army Ordnance Museum at the Aberdeen Proving Grounds, Maryland. The tank has since been relocated to Fort Benning, Georgia. Another can be found outside the Engineering School, Fort Leonard Wood, Missouri. The tank’s unofficial nickname name, “Zippo” (after the lighter brand, as stated in the introduction), is somewhat mysterious. Just like the M60A2 and it’s “Starship” name, a concrete source cannot be stated when this name came into use. It was likely given by the crews or infantry (Grunts to the USMC) that operated with the vehicle. Armament Main: M7-6 Flamethrower, 365 gallonso of fuel. Hello my name is Landon , I feel as if the use of such an important MBT at the time as a Self propelled flamethrower a use of valuable AFVs. I would have considered a lighter vehicle with the M7-6 flamethrower or similar weapon if it existed a better platform for the weapon. I feel that in a time such as the 1960,s when a major war was entirely feasible at the time that using so many m48s as Self-propelled flamethrowers would be an inefficent use of resources. Cotton dioxide fire extinguisher? Probably a typo! Carbon dioxide seems more realistic!